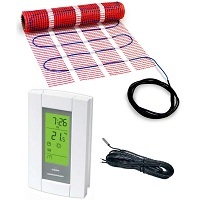 Each HeatTech MATKIT includes a 120V 7-day programmable thermostat with sensor and a designated size mat. HeatTech mats can be installed under a variety of flooring surfaces, with most prominent being ceramic (including porcelain) and natural stone tiles. The system is suitable both for “dry” areas, such as living rooms and sun rooms and “wet”, such as standing showers, bathrooms, saunas and alike.